Workshops and performances by Pete Edwards, Merche Blasco & Thessia Machado, Sofy Yuditskaya & Eric Barry Drasin, and Alex Nathanson & Dylan Neely. This series explores the tools and techniques involved in the creation of hybrid audio and visual artworks including installation, interactive environments, and film/video/sound performance. Emphasis will be placed on tactile interaction and manipulation, and the experimental use (or mis-use) of common technology and re-purposed equipment. This beginner’s course is suitable for anyone who has ever wanted to hack their projector, TV, or game controller, but didn’t know where to start. The series will consist of 3 classes and a performance evening covering a variety of common and accessible techniques including Open Source Programming, Arduino, Circuit Bending, and working with interfaces. The aim is to educate students thoroughly enough so they can complete simple projects and have a foundation for further independent learning. The program also seeks to educate students on the intersections between analog and digital media art, with a focus on cheap and accessible tools. Students are encouraged to take all the classes as a series, but can take them as individual workshops. All workshops cost $5 for additional materials and tools, but students must supply their own computers with Pure Data already installed (download here). For workshops 1 and 3, students must supply their own Arduino. We’ll be working with the Arduino Uno ($25-$30). You can purchase one in NYC at the NYU Computer Store and Radioshack (call your local store to check availability), or online at Adafruit Industries (ships from NYC), SparkFun, Maker Shed, or Modern Device. Introduction to circuit bending with Arduino. 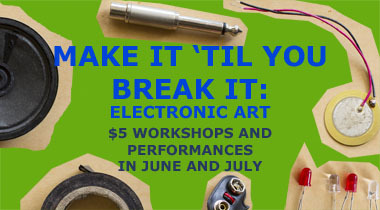 This workshop will demonstrate to students how to hack simple circuits and re-purpose children’s toys in the name of sound. In addition to bringing your laptop and Arduino, please bring a dollar store children’s toy to be modified. The device must be battery operated and generate sound. Introduction to the open source programming language Pure Data. The workshop will focus on working with sound and video. This class will provide an introduction to basic electronic sensors as we explore the possibilities for interaction between Arduino and Pure Data. Thessia Machado was born in Brazil and now lives and works in NY. Her work investigates the physicality of sound and its effect on our perception of space. Lately she’s created pieces that also function as unorthodox instruments – sculptures and installations that have a real-time, live component. Pieces in which the expressive potential is still active and changeable as the viewer interacts with them. Make It Til You Break It: Electronic Art is part of Flux Factory’s 2013 educational initiative, Make It Til You Break It, a series of hands-on workshops that teach practical skills and culminate in a group activity among participants. It is supported, in part, by National Endowment for the Arts, the New York City Department of Cultural Affairs in partnership with the City Council, and the New York State Council on the Arts with the support of Governor Andrew Cuomo and the New York State Legislature. This class is designed to be a quick introduction to off grid solar power, covering basic electronic knowledge, hardware requirements, basic off grid solar circuit design, and how to determine your power needs. August 14th, 7 pm - 9 pm Our August workshop will highlight some projects currently underway in Queens that are helping to increase park space, make transportation safer for pedestrians and cyclists, and empower community members to reclaim a major part of NYC: the streets. Date: Sunday, September 1st, 22nd, and 29th Location: TBD RSVP: witt@sarahwitt.net by August 25th Flux Artist-in-Residence Sarah Witt's Bridges to Beaches is a bicycle tour that investigates the expansive portfolio and social impact of Robert Moses, the so-called “master builder” and urban planner of New York in the 20th century.